In addition to being a poet, Maurice Harmon is the leading scholar-critic of his generation in the field of Anglo-Irish Literature. He pioneered its development as an academic discipline and is the author of a number of significant works, from a basic bibliographical guide to headline studies of Seán O Faoláin, Austin Clarke, Thomas Kinsella, and others. His publications include Seán O Faoláin. A Life (1994), Selected Essays (2006), and Thomas Kinsella. Designing for the Exact Needs (2008). He edited the definitive anthology Irish Poetry after Yeats (1978, 1998) and published The Dialogue of the Ancients of Ireland (2009), a new translation of Acallam na Senórach. His poetry collections are: The Last Regatta (Salmon, 2001), The Doll with Two Backs (Salmon, 2004), The Mischievous Boy and other poems (Salmon, 2008), and When Love Is Not Enough: New & Selected Poems (Salmon, 2010). They keep an eye on only seven companions in the sky. Keeps watching the rooftop where sparrows bank and wheel. Big bash for Maurice Harmon's 80th birthday: The critic and poet Maurice Harmon is one of the most gracious figures on the scene, so it wasn't surprising to see the literati turn out in force for his 80th-birthday celebration in Dublin on Tuesday night. What was surprising was that he now has eight decades behind him, because Harmon has the appearance of perennial youth. Fittingly, Christopher Murray, a colleague from UCD, where Harmon taught poetry for decades, reminded the throng that we were also celebrating the talents of a man still very much in harness. Maurice's own work as a poet is an extension of his work as a life-long lover of and commentator on poetry, especially Irish poetry from earliest times to the present. Also there was the poet Tom Kinsella, on whose work Harmon has written extensively. Kinsella is one of a number of contributors to Honouring the Word: Poetry and Prose. 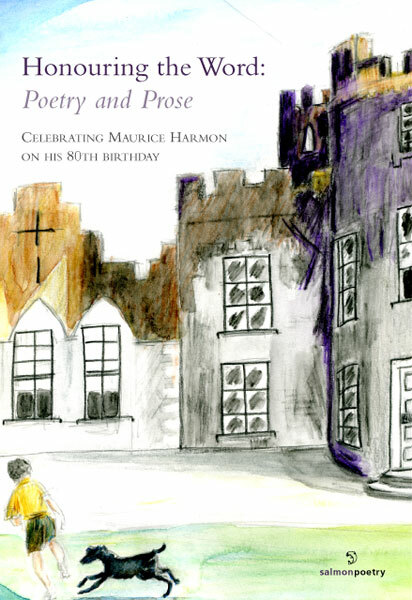 Celebrating Maurice Harmon on His 80th Birthday, edited by Barbara Brown, and published by Salmon Poetry for the occasion. The artwork on the cover is by Harmon's daughter, Maura, entitled Maurice Harmon as a Boy with His Dog Hector at Ardgillan Castle . In his contribution Kinsella writes of his shared beginning in the 1950s with Harmon. Maurice was always an important presence. Our thoughts matched on things that mattered. There were many tributes to his role as an encourager of emerging poets and the value of his essay Advice to a Poet , which remains a mainstay of the Poetry Ireland website. Rosemarie Rowley hailed him as a treasure in the field of Irish studies, open to the birdsong of young poets in a way that was 'tactful yet exacting, encouraging yet bracingly real'. Also launched at the event was Harmon's latest collection of poetry, When Love is Not Enough; New & Selected Poems , also published by Salmon.